1.1 This test method1 covers the determination of the resistance to abrasion of hosiery garments using the Stoll Quartermaster with the elastomeric pad. 1.2 The values stated in SI units are to be regarded as standard; the values in English units are provided as information only and are not exact equivalents. 1.3 This standard does not purport to address all of the safety concerns, if any, associated with its use. It is the responsibility of the user of this standard to establish appropriate safety and health practices and to determine the applicability of regulatory limitations prior to use. 3.1.2 courses, n. —in knitted fabrics, the series of successive loops lying crosswise of a knitted fabric, that is, lying at right angles to a line passing through the open throat to the closed end of the loops. 3.1.3 wale, n. — in knitted fabrics, a column of loops in successive courses that is parallel with the loop axes. 3.1.4 For definitions of other textile terms used in this test method, refer to Terminology D123. 4.1 The fabric specimen is mounted over an elastomeric pad and rubbed vertically against an abradant. The endpoint is evaluated and determined. 5.1 The measurement of the resistance to abrasion of textile and other materials is very complex. The resistance to abrasion is affected by many factors, such as the inherent mechanical properties of the fibers; the dimensions of the fibers; the structure of the yarns; the construction of the fabrics; and the type, kind, and amount of finishing material added to the fibers, yarns or fabric. 5.2 The resistance to abrasion is also greatly affected by the condition of the tests, such as the nature of the abradant, variable action of the abradant over the area of specimen abraded, the tension of the specimen, and the dimensional changes in the specimen. 6.1.1 O Ring —The rubber O-ring holds the specimen firmly in place without distortion during the test. The circular opening of the ring is 5.0 + 0.50 cm (2.0 + 0.19in.) in diameter. 6.1.2 Conical Mounting Piece —The mounting piece holds the specimen over the elastomeric pad and facilitates the insertion of the rubber O ring over the test specimen into the groove of the sample holder. 6.1.3 Specimen Holder —The specimen holder has an elastomeric pad in the center, where the specimen is abraded. The diameter of the pad should be 40.0 + 2.0 mm (1.0 + 0.56in.) in diameter. 6.1.4 Head Weight(s) —Apply head weights totaling 907 + 0.18g(2.0 + 0.1 lb.). The head weights provide constant pressure to the abrading plate, resulting in uniform abrasion. 6.1.5 Abradant Plate —The material used perform abrasion (abradant) is placed on the abradant plate. The dimensions of the abradant are: 8.80 + 0.20 cm (3.50 + 0.125in.) wide, and 11.0 + 0.50 cm (4.50 + 0.125 in.) long. 6.1.6 Clamping Ring — The clamping ring holds the specimen holder in place during testing. The circular opening of the clamping ring is 94.0 + 1.3 mm (3.70 + 0.05 in.) in diameter. 6.2 Toothbrush —A medium bristle toothbrush is required to remove any matted fibers (pills) formed during testing. 6.4 Templates— With a diameter of 104.0 + 2.0mm (4.0 + .125 in. ), a circular template is prepared for obtaining abrasion test specimens. 6.4.1 In the center of the template, another circle, 45.0 + 2mm (1.77 + 0.08 in.) in diameter is marked and cut out. 6.5 China Marker —The test area of the specimen is marked using a China Marker. 6.6 Toothbrush —A medium bristle toothbrush is suggested for use of removing pills during abrasion testing. 7.1 Take one specimen per garment. 7.2 In the absence of applicable specifications, evaluate a minimum of three specimens. NOTE: While data on single-operator precision are not available, the use of three specimens per test is generally accepted in the field. 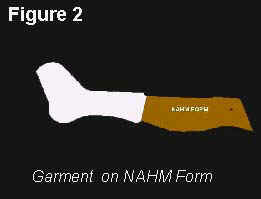 8.1 The test sample is obtained by placing the garment on a NAHM foot form (see Figure Two). The form size used should represent the maximum size of the garment, as represented on the label. For example, a 9-11 stretch men’s sock should be tested on an 11.0 M (Male) NAHM foot form. 8.2 After the garment is placed on the NAHM foot form, the template is used to obtain a test specimen. 8.3 Mark the circular testing area by centering the template between the toe and heel cups of the bottom of the NAHM foot form. The template should be positioned in a manner that it covers both sides of the NAHM foot form and garment. 8.4 Cut specimens at least 35.0 + 5.0 mm (1.50 + 0.125 in.) in distance from the marked 45 + 1 mm (1.75 + 0.125 in.) testing area of the garments. 9.1 Condition the specimens under standard conditions of 65 + 2% relative humidity and 2 + 10C (70 + 20F). 10.1 Installation of TrizactTM—Place TrizactTM on the abradant plate. 10.2.1 Apply head weights totaling 907.18 + 0.1 gram (2.0 + .01 lb.) to the balanced abradant head. 10.2.2 Set the abradant plate in the up (locked) position. 10.2.3 Set cycle counter to zero. 11.1 Conduct the test in the standard atmosphere for testing textiles. 11.2 Remove the specimen holder from the tester. 11.3 Place the test specimen over the elastomeric pad with the wales of the garment running parallel to the abradant plate’s direction of travel. 11.4 Place the conical mounting piece over the specimen. The outer edge of the marked area of the specimen should appear just inside the circle of the mounting piece. 11.5 Insert the rubber O ring over the mounting piece and specimen and into the grooved area of the specimen holder. 11.6 Remove the mounting piece. 11.7 Replace the specimen holder with test specimen onto the CSI Stoll Quartermaster. 11.8 Gently lower the abradant plate until it contacts the test specimen and push the “start” button. 11.9 Abrade for 100 cycles and stop the machine. 11.10 Raise the abradant plate, and observe the specimen. 11.11 Use a toothbrush to gently remove pills of matted fibers interfering with proper contact between the specimen and abradant during the test. 11.12 Lower the abradant plate, and repeat 11.9 – 11.11 until an endpoint is reached. The two forms of endpoint are discussed in Section 12. 12.1.1 Failure —Abrade the specimen until all fibers in a section of the abrasion area are worn off. 12.1.2 Visual Rating —Abrade the specimen a specified number of cycles and evaluate visually for the effect of the abrasion on fabric structure. 13.1 State that the specimens were tested as directed in the specified test method.Describe the material or product sampled and the method of sampling used. 13.2.4 Any deviations from the standard test procedure. 14.1 Precision— The precision of this test method for measuring the abrasion resistance of hosiery by the CSI Stoll Quartermaster with elastomeric pad is being established. 1 This test method is based upon the development described by R. G. Stoll, in “Improved Multipurpose Abrasion Test and Its Application for the Wear Resistance of Textiles,” Textile Research Journal, July 1949, p. 394. 2 Annual Book of ASTM Standards, Vol. 07.01. 3 National Association of Hosiery Manufacturers; 447 S. Sharon Amity Rd. ; Charlotte, NC 28211; tel: 704/365-0913; fax: 704/362-2056. 4 The CSI Stoll-Surface Abrader Model CS_59, or Universal War Tester Model CS-22C has been found suitable and is available from Atlas Electric Devices Co. Inc., 41214 N. Ravenswood Ave., Chicago IL 60613; 773/327/4520; fax: 773/327/5787. 5 TrizactTM is a trademark abradant of 3M Incorporated: 3M Center; St. Paul, MN 55144-1000.